On Saturday 30 March, Slovak voters elected a new president. The election sparked a wave of interest from international media. Slovakia, a country not used to being in the spotlight (at least not in the positive sense) was suddenly celebrated as the liberal leader of Central Europe. 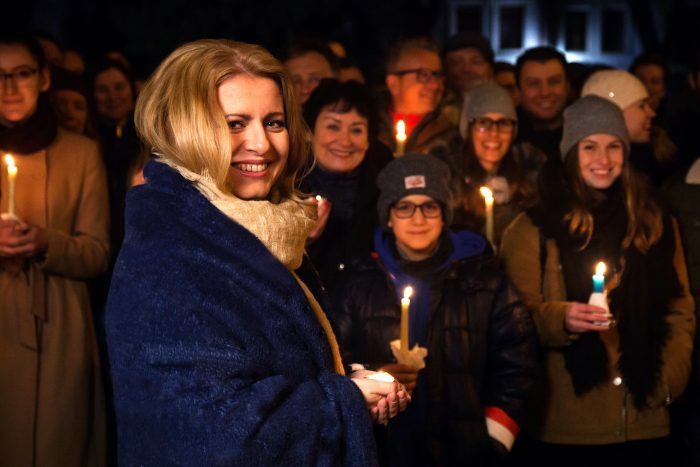 Zuzana Čaputová’s victory was enthusiastically welcomed by liberals in Slovakia, as well as abroad. The Financial Times poetically wrote that “Slovakia offers a ray of hope in central Europe.” Shortly after the results were published, Slovakia’s current president, Andrej Kiska, congratulated Čaputová on her victory and announced his ambition to become the country’s next prime minister. Last week, he said he would establish a new political party, which clearly unsettled the ruling coalition. Čaputová’s unexpected victory certainly gives hope to many Slovaks, who seem to have finally grown tired of the country’s corrupt political elites. The president-elect is a lawyer and environmental activist and she only entered politics last year, when a new party, called Progresívne Slovensko (Progressive Slovakia), was established by a group of Slovak business people and activists. As its name suggests, the party’s policies are progressive and liberal, which many consider to be a risky political strategy in Slovakia’s conservative society. Or so it seemed until now. Čaputová is mainly associated with a lengthy legal battle in which she defended her hometown, Pezinok. A large waste dump was planned to be built in the city, and its inhabitants were worried about the potential environmental risks this would bring. Pezinok won the case and in 2016, Čaputová received the prestigious Goldman Environmental Prize. She has also worked with NGOs, including civic organisation Via Iuris and Greenpeace. In the election, she faced a curious mix of opponents from the leader of the far-right ĽSNS party Marian Kotleba, to diplomat Maroš Ševčovič unofficially (but indisputably) supported by the ruling Smer-SD party, to chemist and scientist Robert Mistrík. At the beginning of her campaign, Slovaks barely knew her and very few expected her to make it to the second round of the election. A major turning point occurred when Mistrík left the presidential race and endorsed Čaputová. His political views are similar, although perhaps more conservative, to Čaputová’s, so she benefited greatly from the support of his voters. From the beginning of the presidential race, many saw Mistrík and Čaputová as very similar candidates which led to their mutual agreement to stop campaigning and endorse the stronger candidate before the first round. Until the last minute, it seemed that Mistrík had more support, but opinion polls eventually indicated that Čaputová’s overall chances were higher. Mistrík was at Čaputová’s headquarters during the election night and both media and the liberal opposition have acknowledged his contribution to Čaputová’s victory. Throughout her campaign, Čaputová managed to avoid major scandals, which is not a common phenomenon in Slovak and Central European politics. Her opponents launched an active campaign against her in which they accused the chair of her political party of fraud. Similar accusations were made against her brother, and towards the end of the election campaign Čaputová herself was accused of violating a rule concerning her law practice in 2005. Čaputová has certainly brought a new type of politics to the scene. Many are hoping that the new liberal trend will continue next year, when the country is expected to hold general elections. The incumbent president, Andrej Kiska, has recently announced his intention to establish a new political party, the programme of which is likely to be similar to Čaputová’s home base, Progresívne Slovensko. Nevertheless, at least for now, he will not be joining forces with Progresívne Slovensko or its non-parliamentary coalition partner Spolu – občianska demokracia (Together – Civil Democracy). Slovakia certainly has issues to worry about at the moment, which appears to be one of the reasons why the liberal opposition was, at last, able to join forces. Until now, Smer-SD has been able to retain power as opposition parties with similar values and programmes were unable to unite and thus pose a significant challenge to the status quo. The political climate changed last year, when the investigative journalist Ján Kuciak and his partner Martina Kušnírová were murdered. Kuciak had written about organised crime and corruption issues linked to the current government and former prime minister Robert Fico, who resigned following mass protests sparked by the murders. In March this year, the European Parliament raised concerns over the state of the rule of law in Slovakia and Malta. The MEPs highlighted allegations of corruption in Slovakia’s ruling circles, and alleged corruption, money laundering and fraud cases in Malta. To add to the ex-premier’s problems, it has recently emerged that he and his former assistant have communicated with Antonio Vadalà, who is linked to the notorious ‘Ndrangheta organised crime group. The assistant is also alleged to have been Vadalà’s former romantic partner and business associate. Recent legal developments in Slovakia have encouraged those who seek an improvement in the application of justice. In March this year the high-profile but controversial businessman Marian Kočner, who was also behind the Pezinok waste dump, was charged with ordering the murder of Kuciak and Kušnírová, and Ladislav Bašternák, also a controversial businessman (and Robert Fico’s landlord), received a 5-year prison sentence for tax fraud in the same month. Michal Šimečka, vice-chairman of Progresívne Slovensko told Aperio Intelligence that Čaputová’s successful campaign is due to her credentials in fighting for justice and the rule of law. “While much of the political establishment remains tainted by ties to Mr Kočner and his practices, Čaputová actually confronted Kočner in a major case – and defeated him. That is a powerful story at a time when Slovaks are increasingly frustrated with the corrupt nexus of politics, law enforcement and oligarchy. Her story and professional background were a symbol that it could be defeated and that change is possible. This gives us hope and potential for a major change – political and generational – in the upcoming general elections,” said Mr Šimečka. Last year’s protests across the country, held under the slogan “For a Decent Slovakia,” clearly showed widespread discontent with corruption and with ties between senior politicians and organised crime (whether these are perceived or actual, the readiness of Slovaks to accept them as true demonstrates the low level of trust in politicians). Whether this will lead to major political changes will be clearer next year following the elections for a new government. Čaputová’s victory at the recent presidential election, however, is a promising first step.